I've been super duper busy lately with wrapping up classes, papers, projects and the like which explains my infrequent posting habits :( My last day of classes is on Monday but I have a calculus test and an english paper due.... My birthday is this Sunday also! >.< I have finals on the 20th and 21st.... *sigh* Busy busy! I realized I have yet to do a post dedicated to brushes! Brushes are an important part of one's makeup collection simply because they affect the makeup application. I know some people do not find the need to use brushes but I think I can get a more accurate and precise application with brushes and I think it's more sanitary than using my fingers (although I will for certain products). All of my brushes as of now are inexpensive ones you can find at your local drugstore. 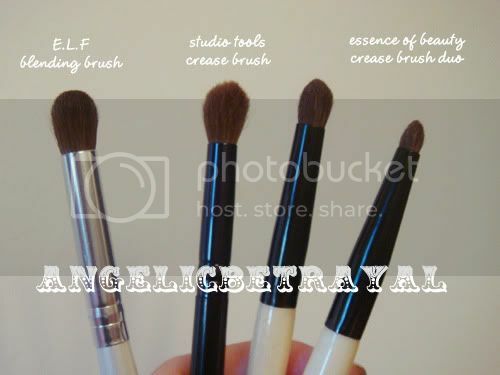 To kick off this series I want to show you guys the four crease brushes in my collection which I use daily. 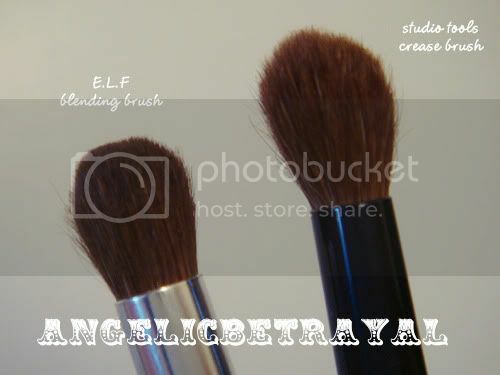 I own two of E.L.F's Blending Eye Brush which only cost $1 each. These brushes are super affordable and can be found on the eyeslipsface website or at Target. The brush is quite dense and the bristles are decently soft so that they apply color pretty well. I like to use this brush to dab on color to my outer corner and blend into my crease or simply to blend away harsh lines. I highly recommend you guys to check this brush out if you're looking for a basic blending brush! The Studio Tools Crease Brush can be found at Target for about $2. It is less dense and more fluffy than the E.L.F brush and feels softer as well. I like to use this brush to blend colors into my crease or to blend out colors at the outer corner for a soft effect. This brush is not as good for placing a lot of color since it is a tad floppy. 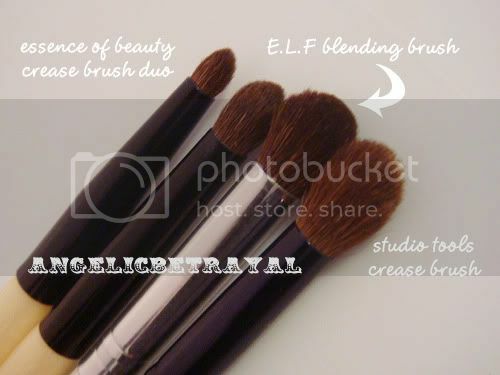 You can also use this to sweep a light layer of shimmery shadow on the lids for a natural look. I love this brush a lot and I highly recommend you pick it up. The next two brushes are from Essence of Beauty which you can find at CVS. The two brushes are pretty much identical but one is smaller than the other and they come in a pack for around $5-6. These were the first brushes I ever bought (about a year and a half ago?) and I still use them today. The larger brush is great for placing and blending colors in the crease and outer third of the eye. It is just the right size for my small eyes. The smaller brush is great for defining the outer corner, highlighting the inner corner, or lining the lower lashline. You can also use it to smudge and set your liner for a smokey effect. I will admit the larger crease brush scratches my eyelids sometimes although they feel soft to my fingers.... Not sure why but it has a tendency to irritate my lids if I blend for awhile. Nonetheless I still recommend these brushes! So now you know what crease brushes I have in my collection and hope you found these reviews helpful! My brush collection is relatively small and I have not purchased new brushes in awhile actually. Brush collections should be bought over a large span of time so that you have time to use and figure out what you like and what more you need. I'm planning to buy the Mac 217 Tapered Blending Brush in the near future as well simply because I think it is a very versatile brush :) I also have my eye on the 224 Blending Brush but that isn't as urgent. I also really like Ecotools so I want to pick a few more of their brush sets as well since they are more affordable. Brushes usually have a specific function that they're meant to be used for but I don't really think anyone needs to follow those suggestions. They're simply suggestions and whatever you think will be appropriate can work! I think there are a lot of bargain, inexpensive brushes that work very well and if you are a beginner you shouldn't need to spend hundreds on Mac brushes. I have yet to own a Mac brush although I intend to start buying them one at a time to build up my collection. Do you guys have any favorite crease brushes? I'd love to know what you guys swear by in your daily eye routine!